Show your support for the Zoo. Donors play a crucial role in the success of the Central Florida Zoo & Botanical Gardens’ education and animal care programs, and conservation initiatives. Making a gift to support the Zoo has never been so easy. The Central Florida Zoo & Botanical Gardens excels at spreading the message of conservation to the more than 300,000 guests that pass through our gates each year, and the millions of residents in Central Florida. With a focus on education, we provide experiences that excite and inspire action each and every day. 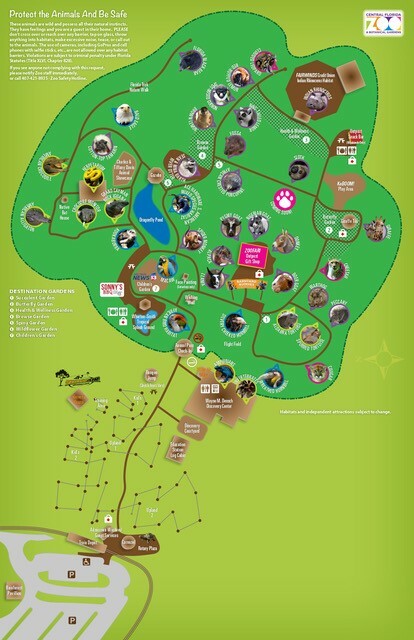 As a 501(c)3 non-profit conservation and education resource for the region, the Central Florida Zoo offers an affordable family experience that would not be possible without the support of private donations. We bring the natural world of threatened, exotic and endangered animals to our guests who may not otherwise have such an opportunity. Through the continued support of our visitors and donors, the Zoo creates lasting learning opportunities, through exceptional animal care and welfare, in beautiful naturalist surroundings in Central Florida. Central Florida Zoo & Botanical Gardens’ rating and other information about charitable giving are available free of charge on www.charitynavigator.org. More detailed information about Central Florida Zoo’s rating is available to Charity Navigator site visitors who become registered users. YOUR CONTRIBUTION IN SUPPORT OF THE CENTRAL FLORIDA ZOO & BOTANICAL GARDENS IS TAX DEDUCTIBLE TO THE EXTENT PERMITTED BY LAW. THE AMOUNT OF THE CONTRIBUTION THAT IS TAX DEDUCTIBLE FOR FEDERAL INCOME TAX PURPOSES IS LIMITED TO THE EXCESS OF ANY MONEY AND THE VALUE OF ANY PROPERTY OTHER THAN MONEY CONTRIBUTED BY YOU LESS THE FAIR MARKET VALUE OF GOODS OR SERVICES PROVIDED TO YOU BY THE CENTRAL FLORIDA ZOO & BOTANICAL GARDENS. A COPY OF THE OFFICIAL REGISTRATION #CH 720872 AND FINANCIAL INFORMATION MAY BE OBTAINED FROM THE DIVISION OF CONSUMER SERVICES BY CALLING TOLL-FREE (800-435-7352) WITHIN THE STATE. REGISTRATION DOES NOT IMPLY ENDORSEMENT, APPROVAL, OR RECOMMENDATION BY THE STATE. There are many companies and organizations that offer employee matching programs. These programs allow employees to give to the charity of their choice with the company/organization matching a portion of that gift. Please check with your employer to see if you have a participating program that will match your gift to the Zoo. If your employer requires the Central Florida Zoological Society Inc.’s Employer Identification Number (EIN)/Federal Tax Identification Number, please use 59-1357197. The most flexible way to make an estate gift to the Zoo is by including our organization in your will or trust. Bequests represent a significant future revenue source for the Zoo while also offering you the flexibility to control or make changes to your charitable plans in the future. Our keepers are involved in our animals’ lives and welfare from birth to death and every moment in between, and create life long bonds with the animals and our visitors. A Zoo staff member’s day can include an array of tasks from cleaning, food preparation and feeding, to medical treatment, training, enrichment, landscaping, exhibit design, and animal introductions, as well as public outreach, education, and much MUCH more. We’ve made it even easier for you to have an impact on the daily activities that our animals and their keepers take part in! The Central Florida Zoo & Botanical Gardens’ Amazon Wish List contains everything from animal enrichment items and treats, to medical supplies and even pieces for their exhibits. We welcome donations from the public of the following items currently on the Central Florida Zoological Society’s Amazon Wish List. These specific items have been requested by our keepers, veterinary and education staff members. Items will automatically be sent to the Central Florida Zoo & Botanical Gardens after purchase. If you use Amazon, there is a simple and automatic way for you to support the Zoo every time you shop, at no cost to you. When you shop AmazonSmile and select the Central Florida Zoological Society as your charity, Amazon will donate a portion of the eligible purchase price to support conservation and education programs at the Zoo. Getting started is easy, visit http://smile.amazon.com/ch/59-1357197 and sign in or create an account. And don’t forget to sign in through AmazonSmile every time you shop to support the Zoo.